Historical Accounts of the Great Pyramid. The structures at Giza have suffered from natural erosion, defacement, pillage, additions and alterations, all of which have reduced us to interpretation in order to visualize the complex in its original condition. In order to compensate for the lack of original Egyptian references, it is worth first exploring the accounts of the earliest explorers, whose observations read like the frames of a film. Middle Kingdom Papyrus at Leiden. Abdallah Muhammed bin Abd ar-Rahim al Kaisi. 1730-1575 BC - The earliest accounts of Giza record that it was a site of pilgrimage for 'Sabian' star worshippers from Harran. 'Long live the King of Upper and Lower Egypt, Khufu, given life. He found the house of Isis, Mistress of the Pyramid, by the side of the hollow of Hwran (The Sphinx). And he built his pyramid beside the temple of this goddess and he built a pyramid for the King's daughter Henutsen beside this temple. The place of Hwran Horemakhet is on the South side of the House of Isis, Mistress of the pyramid. The figure of this god, cut in stone, is solid and will last to eternity, keeping its face looking always to the East' . It is suggested that this text is a reference to the 're-opening' of pyramids. Question: When was the Great pyramid first re-entered? It is not uncommon to read that Al-Mamoun (see below) was the first person to gain access to the upper parts of the Great pyramid since its original closure. However, in order to explain certain features of the 'Well-shaft', it is now generally accepted that the pyramid had already been entered before Al-Mamoun's time. The evidence of 'repair work' in the 'King's chamber and relieving chambers has led to the suggestion that the lower parts of the Well-shaft may have been cut through by a team of repair workers after the upper parts had been sealed. Whoever cut the passage that leads from the Grand gallery to the lower relieving chamber, now called 'Davison's chamber', left a neat, square-cut passage. They also plastered-over the cracks in the granite blocks above the Kings chamber. This work, at least, certainly appears to be that of a 'repair-crew'. However, the last, rough-cut section of the well-shaft shows no such precision, the same can be said for the entry into the Grand gallery, the Queens chamber, the 'portcullis' system, and the Coffer, all of which show evidence of a more 'forced' entry. Extract from Petrie : When, then, was the Pyramid first violated? Probably by the same hands that so ruthlessly destroyed the statues and temples of Khafra, and the Pyramids of Abu Roash, Abusir, and Sakkara. That is to say, probably during the civil wars of the seventh to the tenth dynasties. It is probable then that while repair-work may have been carried out within the pyramid at some time, there is also evidence that the pyramid was forcibly entered and 'stripped' of its possessions soon after its completion. The accuracy of the tunnelling of the well-shaft and apparent knowledge of all its upper chambers is supported by the Leiden papyrus (above), and although the evidence is still circumstantial, it is a distinct possibility that the document could explain a number of unexplainably accurate 'forced entries into early dynasty pyramids, especially Mastaba 17, for example. Records that the Sphinx was cleared of sand by Thutmose IV following a dream. Evidence for Thutmosis IV's campaign is preserved in the so-called dream Stele he erected between the two paws of the Sphinx in ca. 1400 BC. According to the story inscribed in the Stella, the Sphinx spoke to him in a dream and asked the prince to free him from the sand. The Sphinx (Hor-em-Akht) offered in return the crown of Upper and Lower Egypt. It is often quoted as associating the sphinx with Khafre. ...which we bring for him: oxen... and all the young vegetables; and we shall give praise to Wenofer ...Khaf.... the statue made for Atum-Hor-em-Akhet. From this story we at least know that the Sphinx was buried up to its neck again in 1400 BC. Ramasses II Restoration. (1,287 BC). Pochan (16), makes note of an inscription carved in the bedrock opposite Kephren's pyramid. It records a 'restoration' of the two great pyramids of Giza by Ramasses II minister of labour, 'Mai, "grandee of the temple of Maat," and Seankh-Pa, superintendent of construction at the temple of Amon in Thebes'. Pochan also mentions the similarity with a symbol 'carved deep in the bedrock, the same as the mysterious symbol that is carved in the ceiling of the great pyramid's subterranean chamber'. (Extract from Herodotus - c. 430 BC. 'The Histories', Vol II: 124. By Sir. Henry Rawlinson). Herodotus' record remains the first known historical account of the complex. He wrote that 'Cheops' built the great pyramid (but that he was despised for it). He said that the casing stones had 'inscriptions of strange characters', and was told that it took 100,000 men 20 years to complete (the Great pyramid), that iron was used in the construction, and that they used 'machines' made of 'short planks of wood' to lift the blocks. Question - Was the pyramid complete at the time of Herodotus report? It appears that the casing stones were present at the time of his visit. However, he fails to mention whether there is a top or not. This leans towards the idea that it was there, as one would expect the fact to have been noted had it been missing (or gold). In fact, he gives measurements of the two pyramids, clearly, (and reasonably correctly), stating that Khafre's pyramid is '40 ft lower', without mentioning the top. While Herodotus reports are all clearly important, in this case, it is not for the details he includes (i.e. the tale of the phoenix, the means by which Khufu's wife procures the blocks for her pyramid, an inscription about the price of vegetables and 'machines' made of small planks), but more for the details he neglects to include. It is already noted for example, that the top is neither mentioned of as missing or in any way different to the rest of the pyramid in this report; he makes no mention of any entrances, or even the sphinx, not even its head (strange?). There is little sense of the natural awe or wonder one would expect from a visitor to Ghiza, and while he tells us that his information came from 'priests', his report lacks a number of significant facts while elaborating over trivia. It is worth considering how extensively he visited the site himself. Seiss (15), adds that 'Manetho is quoted by Josephus and others, as saying "We had formerly a king who's name was Timaus. In his time it came to pass, I know not how, that the deity was displeased with us; and they came from the east and when they had our rulers in their hands they demolished the temples of the gods" (see coreys fragments, p257) This Timaus of Manetho is doubtless the same person as the Chemes of Diodorus, the Ceops of Herodotus, and the Chufu or Suphis of the monuments'. And that "some say they were Arabians" which left Egypt in large numbers and went to "That country now called Judea, and there built a city and named it Jerusalem". (Note: Check Manetho text in 'Fragments' by Isaac Preston Cory, Cambridge. 1832). 'Josephus the learned scribe, gives it as historical fact that Seth and his immediate descendants "were the inventors of that peculiar sort of wisdom which is concerned with the heavenly bodies and their order. And their inventions might not be lost before they were sufficiently known, upon Adam's prediction that the world was going to be destroyed, they made two pillars (Note: Masonic association), the one of brick, the other of stone. They inscribed their discoveries on both of them, that in case the pillar of brick should be destroyed by the flood, the pillar of stone might remain and exhibit these discoveries to mankind." He also said, "Now this (pillar) remains in the land of siriad (Egypt) to this day." (Jewish antiquities, I, 2). Diodorus Siculus. (c. 56-60 BC) - (Book I, 63.4-64.14). He tells us that in his day, the Pyramid stood 'complete and without the least decay, and yet it lacked its apex stone'. Diodorus also states that the remains of Cheops were never buried therein. (7). Extract from Petrie: Diodorus Siculus states the distance of the Pyramids from the Nile with great accuracy The base of the Great Pyramid he gives as 7 plethra, or 700 Greek feet, as against 747 such feet in reality; hence he is accurate to less than half a plethron. The height, he says, is more than 6 plethra; the arris height is actually just over 7 plethra, when complete. He mentions the fine preservation of the stone, and that the original jointing was uninjured by time, showing that the fine joints attracted his attention. The Second Pyramid he only roughly describes as a stadium wide; but this is not far wrong, as it is 7/6 stadia. The Third Pyramid he underrates as 300 feet long, whereas it is 340 Greek feet; if however, he originally wrote 3 plethra, he would be correct to less than half a plethron, as he is in the Great Pyramid size. It is noticeable that he slightly underrates all the Pyramids, his statements being respectively .94, .87, and .88 of the truth. 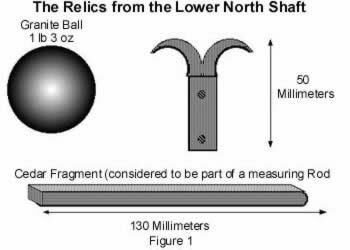 He states that the sides up to the 15th course were of black stone; actually it seems probable that the dark red granite ended at the 16th course : and he says that the upper part was cased with the same stone as the other Pyramids, which is plainly true to anyone who sees the angular fragments lying thickly around it. Though Vyse was disappointed at not finding the name of Menkaura inscribed over the doorway, yet Diodorus only says that it was on the N. side of the Pyramid; hence it was probably on the fine limestone above the granite. Note - Diodorus mentions a step carved into the second (Khafre's) pyramid face. Strabo's account. (24 BC) - ('Geographica'). (Extract from 'The geography of Strabo' (Trans. By H. L. Jones) (New York: G. P. Putnam's Sons) Vol. III, p. 84-5). "The Greater (Pyramid), a little way up one side, has a stone that may be taken out , (exairesimon, exemptilem) which being raised up (arqentoV, sublato) there is a sloping passage to the foundations." Extract from Petrie: Strabo's account is less careful in the dimensions, merely giving roughly a stadium for the height and base of each of the larger Pyramids, and saying that one is a little larger than the other. As these dimensions vary from .85 to 1.25 stadia, he is, at least, quite as accurate as he professes to be. He gives the invaluable description of the Great Pyramid doorway, which . so exactly accords with the only remaining doorway of a pyramid. He also mentions the Third Pyramid being cased nearly up to the middle with black stone from Ethiopia. Strabo also stated that this entrance led into a narrow and low passage, about 4 feet by 4 feet, which descended 374 feet into a damp, vermin-infested pit dug from the bedrock 150 feet below the base of the Pyramid. Pliny's account. (20 AD) - (From 'Natural History' : Book 36). Pliny quotes Herodotus on the price of vegetables but apart from that his account provides new information. He wrote that 'In the interior of the largest Pyramid there is a well, eighty-six cubits deep, which communicates with the river, it is thought', and; 'It is asserted by most persons that the only motive for constructing them was either a determination [by the kings] not to leave their treasures to their successors . . . or to prevent the lower classes from being unoccupied'. (Ref: Natural history).. The Well-shaft can be separated into seven sections, with the upper three sections passing through 60 ft of limestone masonry and the lower segments being tunnelled through another 150ft of natural rock. Extract from Petrie: Pliny gives a more exact measurement than any other ancient author, stating the Great Pyramid base as 883 feet. This would require a foot of 10.2705 inches; and this is just half of the cubit of 20.541, or a rather short form of the Egyptian cubit, Taking the mean cubit, we cannot tax him with a greater error than 1/230 of the whole, which is quite as close as some of the most credible measures taken in this century. Pliny said that 360,000 men were needed, and that it took 78 years and four months to complete all three pyramids. As he quotes Herodotus elsewhere, perhaps this is just an extension of his original figure. He introduces some different building methods and says that the third pyramid was built by a woman called 'Rhodopis', once a slave-courtesan of Aesopus. He also notes that the locals were 'in the habit of ascending them'. Comment - Pliny makes only one reference to the interior of the pyramid, and he ends it with the words 'it is thought'. We can assume that he did not enter. He also makes no reference to the missing top. His information about the well-shaft is revealing. Who told him and how did they know? Solinus pointed out the phenomenon of the 'consumption of the shadow' on the pyramids face (16). We also know from later accounts that the pyramid still had its casing stones on after this date. We can safely assume that the effect was a part of the original design. Dionysius of Telmahre: (Date unknown - From Jomard). The first recorded 'Forced entry' by the 7th Abbasid Caliph, Al-Mamun of Baghdad, son of Harun Al-Rashid from the 'Arabian knights', Caliph of Cairo. It is generally considered that he was the first person to re-enter upper parts since the pyramids closing. Unfortunately, as Col. H. Vyse pointed out 'The only fact which seems to be established by the Eastern authors to whom we have now referred (the Arabians), is the opening of the Great pyramid by Al Mamoun; and even of that, no distinct or rational account exists.' (15). According to most versions, he arrived at the Pyramid with an army of scholars (workmen, engineers, architects and masons). For days they scoured the surface for an entrance, but drew a blank. He apparently decided to enter by force at the 7th level of masonry. (The actual entrance is on the 19th course). Having dug or blasted their way through approximately over 30 metres of masonry, they apparently heard (from about 24 ft away through solid masonry), the sound of a stone falling, at which point they turned towards the noise and eventually broke into the descending passage. At this point, they apparently realised that the fallen prismatic block had previously concealed the mouth of the ascending passage and so dug around the granite blocks. Extract from Miracle of the Ages - 'The whole ascending passage, to their great dismay, was filled with large, loose stones. When one was removed the next, beneath the weight of the others above, slid down into the place of the first. Finally the last block was removed Up they went into the Grand Gallery. One or two stopped to examine and peer closely into the well Into the queen's chamber the men forged Into the Ante-Chamber they went. Still the promised riches eluded them. Beneath the last, low-suspended stones they crawled, coming out into the beautiful Kings chamber Alas the coffer was empty". The account continues ' That night under the cover of darkness, while his weary men slept soundly, Mamoun, who was very rich, carried, with the aid of a few trusted officers, many gold coins to a spot adjacent to the pyramid and buried them securely. Next day he confronted his men and in his grandiose manner announced that in a vision during the night Allah had revealed to him where the wealth that they had been seeking really lay. The man dug at the spot directed by the Caliph, and soon uncovered the cache of gold'. A number of pyramids had already been opened, and the descending polar passages would have been general knowledge by the time of Al-Mamun. The presence of an entrance and internal tunnels in the great pyramid had been recorded by Pliny, Strabo, etc. As we are told that the pyramid was sealed when he arrived, one has to ask why he started digging where he did (off-centre), and why he continued to dig horizontally into the pyramid for so long (over 30 metres), when no other pyramid has upper chambers or corridors. His passage leads in an almost (uncannily) direct line to the junction of the ascending and descending passage. Although Petrie states the tunnel to have been cut through the 7th course of masonry, he also shows it to run through the 6th course. At present, it is cut through at least two (the height of an average person). It is a curious fact that the 6th course of masonry is also the top level of the bottom stone that hid the granite blocks. This means that they would have been digging only one level above the actual junction of the descending and ascending passages. While the tunnel certainly bears down and left, it only does so at the end, after the ascending passage, and at the point of the granite plugs and junction. Is it really possible to hear/feel a stone drop 4ft, from behind approx 24ft of solid stone, and identify its exact direction, presumably while digging etc.. Question - Was Al-Mamun trying to reach the granite 'plugs' specifically? Answer -If the original, northern entrance was truly lost when he arrived, he took an incredible risk (almost foolish), digging into the pyramid the way he did. As 'polar' passages in pyramids were already well known, it is likely that he had more information available to him at the time. The same conclusions were reached by Mark Foster and Ralph Ellis ('Tunnel Vision, About the Great Pyramid'), who believe that the 'Trial passages' were left as a clue, that Al Mamun realized this and the reason he dug such a large 'exit' tunnel was to 'get something out' of the pyramid, and that he had with him the coffer lid - now the K'aba of Mecca. An interesting theory. The main criticism with this theory is that the 'Trial passages' are not the same. In fact they show distinct differences. (i.e. Why didn't they try to find the vertical tunnel above the plugs). Isn't the K'aba supposed to be a meteorite? While most books on the Great Pyramid talk about the first 'forced-entry' by Al-Mamun, the following quote from 'Egypt - Gods, Myths and religion', creates a different version of events altogether. 'It is, in fact, highly likely that Al-Mamuns men made use of a passage created by ancient thieves. A man named Denys of Telmahre, the Jacobite Patriarch of Antioch, was present when Al-Mamun entered the pyramid, and he states that the pyramid had already been opened before their visit...The same but (albeit tamed) story was recorded by Abu Szalt of Spain. Rather than fabulous treasure, he reports that Al-Mamun's men discovered only a sarcophagus with some old bones inside it'. If it is the case that it had been forcibly-entered before, then we are faced with a new set of questions (i.e. who and when). Comment - The direction of the hole that Al-Mamun dug is beyond serendipity. We should consider the probability that he was specifically trying to reach the upper parts. It is possible that if this were the case, the upper parts had already been previously breached. Masoudi (Died 956 AD) - (Extracts from 'Meadows of Gold and Mines of Gems'). He (Surid) also ordered the priests to deposit their wisdom within them (The pyramids), written accounts of their wisdom and acquirements in the different arts and sciences with the writings of the priests containing all manner of wisdom, the names and properties of medical plants, and the sciences of arithmetic and geometry, that they might remain as records, for the benefit of those who could afterwards comprehend them In the eastern pyramid (Great pyramid) were inscribed the heavenly spheres, and figures representing the stars and planets The king, also, deposited the positions of the stars and their cycles; together with the history and chronicle of time past, of that which is to come, and every future event which would take place in Egypt' (2). 'When questioned about the construction of the pyramids, he said, "They were the tombs of kings. When one of their kings died, his body was placed in a basin of stone, similar to what is called a djaroun in Egypt and Syria; the cover was sealed, then they began to build, having determined the height of the pyramid in advance. They placed the sarcophagus in the centre of the structure and continued to raise the vault until it reached the eight that you see"
"The door was placed under the pyramid itself, and one entered it through a vaulted, underground passage, which could be 100 or more cubits long; each pyramid had such a door and entry". "But," he asked, "How were the smooth pyramids built? How could the workers climb up and work? With the help of what machinery did they transport these enormous stones, a single one of which cannot be lifted now without incredible effort, if at all?" The Copt answered "They built the pyramids in superimposed layers, step-by-step, like a staircase; then they polished them from the top to the bottom. This was the working procedure of these people who combined admirable strength and patience with religious respect for their kings". He was asked why the inscriptions which cover the pyramids and the temples were indecipherable. He answered: "Since the learned men and those who used this writing have disappeared, and Egypt has been occupied by a succession of foreign peoples, the Greek alphabet and writing have prevailed. As the Copts became familiar with this writing, they used it and combined the letters with those of their own alphabet; from their contact with the Greeks, resulted in a writing related both to Greek and ancient Copt, and thus they lost the understanding of the writing of their ancestors." (16). This text is a likely candidate for the origin of the 'prophetic' theory of the pyramid. It is suggested by Davidson that the origin of the Coptic traditions from which the Arabs recorded, are in fact, erroneous references to the 'pyramid texts', which became confused with known facts of the Great pyramid. 'These monuments - that is, the pyramids - have a length of 480 hachemique cubits and a width that is also 480 cubits. The edifice recedes as it rises from the base and at the summit the dimensions are only 40 cubits; this was done intentionally and by design. In the middle of the plateau a beautiful chamber was built, inside of which a sort of mausoleum was set up. At the top of the tomb are two magnificent, perfectly dressed blocks, surmounted by two stone statues representing a man and a woman facing each other. The man holds in his hand a stone tablet covered with writing and the woman a mirror and a gold tablet decorated with wonderful carvings. Between the two pedestals is a stone vessel sealed with a gold lid; lifting the lid, one perceives a sort of odourless dried resin in which has been placed a gold box enclosing a quantity of blood, which, upon exposure to the air, shows the coagulation peculiar to blood, then dries up. The tombs are sealed with stone lids that, when withdrawn, reveal, in one of the tombs, a man lying on his back, perfectly preserved and dried; his flesh, as well as his hair, is still visible. In the neighbouring sarcophagus is the body of a woman in the same position and the same condition as the man'. 'The pavement is pierced by a man sized passage that plunges like a tunnel; its vault is made of stone, and one finds there portraits and seated or standing statues, and a quantity of other things, the meaning of which is not known'. A possible entry account if we assume that the 1st domed chamber is the Gallery, and the 2nd the Kings chamber. Hard to explain the round features of the dome (Possibly Menkaure's pyramid). Petrie says of him: - 'The clear and unexaggerated account of the passages of the Great Pyramid given by Edresi, deserves notice for its superiority to the greater number of Arabic accounts'. There are some items of information in his account that may be worth noting. Firstly, he is quoted by Vyse as saying 'To the right of him, who ascends, is a well situated between the two alleys (Ascending passage and Grand Gallery), and the just-mentioned door (Horizontal passage to Queens chamber), but below the second alley' (5). The mention of the recesses cut into the sides of the grand gallery, give credence to his personal account. He also has some interesting things to say about the 'Queens' chamber. The following is an extract from Petrie - '(he) mentions an empty vessel in the Queen's Chamber; and that this was not a confused notion of the coffer now known, is proved by his saying that in the King's Chamber "an empty vessel is seen here similar to the former", Whether any fragments of a coffer remained there, among the great quantity of stone excavated from the floor and niche, it is almost hopeless to inquire, since that rubbish is now all shot away into various holes and spaces. Caviglia, however, did not find a coffer when clearing the chamber, but fragments might have been easily over-looked'. Apart from the implications of another coffer, Edresi also wrote that 'On the roof of the room are writings in the most ancient characters of the heathen priests'. Lawton and Ogilvie-herald (5) rightly point out that had the script been in Arabic or Latin, Edresi would have understood their origin. The suggestion is that they were Egyptian hieroglyphs. 836 AD - Papyrus of Abou Hormeis. 1637/8 AD - Prof. John Greaves. "The structure of it hath been the labor of an exquisite hand, as appears by the smoothness and evenness of the work, and by the close knitting of the joints"
An intrepid 36-year-old Oxford mathematician and astronomer who visited Giza in 1938. He made a number of interesting observations, including that the Queens chamber was coated with stucco, and was full of debris. He also notes the two 'ducts' in the kings chamber (with evidence of soot and blackness). (16) He also noted that at the bottom of the Grand Gallery on the right, a stone block had been removed and a passage appeared to have been dug down into the pyramid. This was later called the "Well Shaft". The opening was a little over 3 feet wide and notches were carved opposite one another on the sides of this shaft so someone could climb down with support. Greaves lowered himself down about 60 feet, where he found that the shaft was enlarged into a small chamber or grotto. The shaft continued below him but it was so dark and the air was foul that he decided to climb back up. He wrote ' At the end of it (The Ascending passage), on the right hand, is the well mentioned by Pliny: which is circular, not square, as the Arabian writers describe'. (10). He published his investigations under the title, 'Pyramidographia: A Description of the Pyramids in Egypt (1646)'. This was the first book ever published on the Great Pyramid alone. 1735 AD. Benoit de Maillet's 'Description de l'Egypt'. (French consul general in Egypt 1692 - 1708). Benoit de Maillet was the first Frenchman to record the Great pyramids measurements. He believed that all the pyramid's passages had been plugged with blocks. His record, which is admired more for the 'richness of his imagination' is of very little use, however he does mention that at his time, the well-shaft' was obstructed at a depth of 133 ft (43.2 m) by sand and pebbles from the excavation of the grotto. 1763 AD - Nathaniel Davison. A British Consul at Algiers, lowered a lamp into the vertical section of the Well Shaft, tied a rope around his waist, and had himself lowered after it - only to find the bottom blocked with sand and rubbish. He was the first to discover the lowest of the series of five spaces (called "The Relieving Chambers") over the King's Chamber. The story is that at the top of the Grand Gallery, he noticed that his voice was echoed in a strange way and seemed to resonate from above him. Davison tied a candle at the end of two long canes, raised it up, and noticed at the top of the Grand Gallery the small rectangular hole about 2 feet wide. He put 7 ladders together to climb to the top. He found 16 inches of bat dung in this 2 foot hole that had accumulated throughout the centuries. Davison put a handkerchief over his face and made his way into the hole. After crawling 25 feet, he reached a chamber about 3 feet high but as wide and as long as the Kings chamber beneath. He observed that the floor consisted of the tops of 9 rough hewn granite slabs each weighing up to 70 tons. The ceiling of the King's Chamber was formed by the under sides of these blocks. He also noticed the ceiling of this chamber was also constructed of a similar row of granite blocks. This is a far as he went. This chamber referred to as "Davison's Chamber" was named after him. His measurements also confirmed the fact that the pyramid was constructed so that its sides faced the cardinal points of a compass. It is a curious fact that the only one of the relieving cambers without graffiti was Davidson's, the only accessible one. 1798/9 AD - Napoleons 'Coutelles' Account. Napoleons military expedition to Egypt in 1798 was not only military but archaeological as well. He took with him engineers, surveyors, astronomers, artists and archaeologists. The investigation relevant to this essay is the work of Coutelle, who surveyed, measured, explored, and made drawings of the great pyramid. His work was published in many volumes from 1809 to 1822 by order of Napoleon. The fact that he arrived with so many professionals makes one wonder how exactly they missed the descending corridor. However, the picture on the right confirms that fact. Apart from that, it also records a number of other serious inaccuracies such as the location of the chambers and well-shaft. ......Now the fact is, that Bonaparte never even entered the great Pyramid. He never had any thought of entering it. I certainly should have accompanied him had he done so, for I never quitted his side a single moment in the desert. He caused some persons to enter into one of the great Pyramids while he remained outside, and received from them, on their return, an account of what they had seen. In other words, they informed him there was nothing to be seen!" They were the first to survey the site trigonometrically and to discover two of the corner sockets at the base. The following observation was made by one of Bonaparte's scientists "It is very remarkable that the opening of pyramids are all to the north. The passage seemed fitted for an observatory". 1817 AD - Captain Giovanni Battista Caviglia. The Italian explorer, later hired by Col. Vyse cleared the descending passage of debris, exposing the 'pit' for the first time since the Pyramid had first been opened by Al Mamun (Was it open before then or not). He lowered himself down the well shaft, got over 100 feet below the Grotto, and found, as others had before him, that the air was so scarce his candle sputtered, making it difficult for him to breathe, and that the bottom appeared to be blocked by sand and loose rocks. He had workers remove some debris, but stopped, as the conditions were too bad. Caviglia believed he could discover even more treasure in the King's Chamber. With the use of dynamite, he blasted various holes in the pyramid, searching for chambers and treasure. Caviglia reported finding Latin characters on the subterranean chambers ceiling, (as did Al-Mamun) we cannot be sure when these were daubed, but we know the Descending Passage had been blocked for some centuries before he cleared it, so these could well date to classical times. (Apparently Caviglia also cleaned out the bat dung from Davison's Chamber and turned it into an apartment in which he resided). 1818 AD - Giovanni Batista Belzoni. Discovered the ancient intrusive tunnels into the second pyramid. He described that the portcullis was still lowered, the lid to the coffer pushed aside and was filled with earth and stones and some small bull bones. He found an inscription which said 'The Master Mohammed Ahmed, lapicide, has opened them; and the Master Othman attended this; and the King Alij Mohammed at first to the closing up'. He noticed two square horizontal openings in the in the upper chamber, which he compared with those in the kings and queens chamber of the great pyramid. (10) This information is relevant for context. 1837 AD - Colonel Howard Vyse and J. Perring. Re-opened the forced entry made originally by Al Mamoun early in the ninth century AD (How, when and by who was it blocked). He also rediscovered the corner-sockets previously uncovered by the French in 1799. He discovered two of the original polished limestone casing stones and also discovered and opened up the air shafts to the King's Chamber. He learnt that these shafts extended over 200 feet to the outside of the pyramid. Once opened, an immediate rush of cool air entered the King's Chamber and maintained an even temperature of 68 degrees regardless of the weather outside. Vyse also discovered four other chambers above Davison's Chamber by blasting his way through with gunpowder. It was while exploring these chambers that Colonel Vyse came across the cartouches of 'Khufu' and 'Khum-Khufu', in the form of mason's marks, painted in red ochre, sometimes inverted, on the ceiling beams. Question. Could these chambers and others at the Queens level be a remnant of an earlier construction phase?. He extended Cavaglia's subterranean digging (also found nothing), and extended the hole in the Kings chamber, apparently dug by al-Mamun. (10) He measured separately all the 203 masonry courses of the great pyramid and discovered a flat iron plate, 12' by 4' and 1/8' thick. This plate was removed from a joint in the masonry at the place where the southern airshaft of the king's chamber exits to the outside. Experts concluded that it was left in the joint during the building of the pyramid and could not have been inserted afterwards. 1859 AD - John Taylor . Wrote: 'The great pyramid: Why was it built and who built it'. His perspective is interesting in terms of the chronology of Egypt, and the great change experienced in the early dynasties. He passed the baton to Charles Piazzi Smyth just before he died, and asked him to confirm his beliefs by measuring the pyramid, which Piazzi attempted to honour. 1865 AD - Charles Piazzi Smyth. Astronomer Royal for Scotland. Became a believer in the 'Divine construction' theory. Went to Egypt to measure the great pyramid. He took the first ever photographs inside and measured it more accurately than ever before. He later published the book 'Life and Work at the Great Pyramid'. Scholars published some devastating criticisms of his theories. They showed, for example, that when deriving his formulas Smyth juggled facts and figures until he came up with a seeming correspondence and that much of the data upon which he based his theorizing, such as the average size of the casing stones that had once covered the Great Pyramid, was wrong. 1872 AD - Waynman Dixon and D. R. Grant. Found and opened the 'Queens' star-shafts. Explored and discovered objects in the North shaft of the Queens chamber. 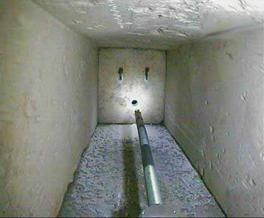 The shaft was explored with an extendable metal rod. (A part of which was found by Upuaut in 1993). The relics were sent to Piazzi Smyth in a cigar box where they were recorded in his diary with accompanying drawings and sketches. Two of the objects were left in the trust of the British Museum. These objects are now recorded as unexplainably lost. In examining the King's Chamber in the Great Pyramid, Petrie found that every roof beam on the south side had broken. Only the inward thrust of the massive walls held the four-hundred-ton granite roof in place. He concluded that his damage had probably occurred before the Egyptians had finished the construction, as mortar covered the cracks. Petrie believed that two architects had worked on the Great Pyramid and that the second was less skilled than the first. The second architect had used rough stone and had often forgotten to dress the stone. The plaster applied to such areas failed to hide these imperfections. Petrie also found cracks that the workers had made in cutting the block for the sarcophagus. My personal respect for Petrie is reflected in the number of times he is quoted verbatim in the course of this essay. 1909 AD - The Edgar Brothers. (Believed in the 'Divine construction' theory). (Extract from the explorations of John and Morton Edgar in 1909). 1992 AD - Rudolf Gantenbrink. Cleaned the 'Kings' chamber 'star-shafts' and installed ventilation fans in May 1992. His team returned the next year with their 'robot' to explore the shafts in the Queen's Chamber. It was unable to go all the way up the Northern shaft because it was unprepared for the bend formed to bypass the Grand Gallery; however, in the southern shaft it was able to reach the known end of it. On March 22nd 1993, it confirmed that this shaft does not reach outside but that it ends at a stone 'door' with two copper fittings. Gantenbrink was unable to complete his work in the pyramid as vital equipment disappeared before the next attempt at the Northern shaft. His expedition was called off. He was not allowed to return to complete the study. 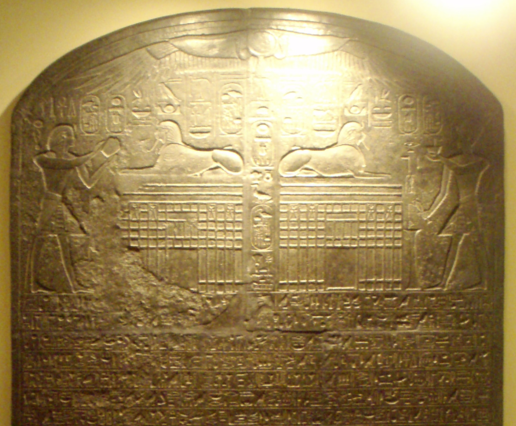 It was later reported that the Egyptians completed this work themselves in 2002 and discovered a 'door' similar to that first discovered by Gantenbrink. Queens southern shaft (left), and northern shaft (right). The earliest accounts are NOT in consensus as to who built Giza or why. Manetho said that the 4th dynasty was composed of eight Memphite kings of a 'different race'. Manetho said that 'Suphis' both 'built the pyramid' and 'wrote the sacred book'. Herodotus specifically states that 'Cheops' was not buried IN the pyramid. There is written evidence that suggests that the pyramids may have been 'opened' soon after their completion. Diodorus mentions the missing capstone, but otherwise the great pyramid is 'complete and without the least decay' in his time. (It was presumably still faced). By the time of the Greeks (Strabo, Pliny), there is evidence that someone knew the layout of the Interior of the pyramid. We can read descriptions of an entrance/door, the descending passage and well-shaft. (Latin inscriptions were later found by Caviglia in subterranean chamber). The 'Consumption of the shadow' was pointed out when the casing-stones were still in place. None of the accounts describe Al-Mamun as having had to 'force' his way after the initial entry. (He may not have been the first person to enter). Al-Mamun notes torch-marks on the ceiling of the subterranean chamber. The upper entry to the Well-shaft was exposed before Al-Mamun's entry. The lower entry to the Well-shaft was not mentioned by Al-Mamoun. Al-Mamun's men are believed to have dug the tunnel in the 'niche' of the 'Queen's' chamber. Edresi c.1245, mentions seeing the top of well-shaft. There may have once been another coffer in the 'Queens' chamber (Edresi). Hieroglyphs on the ceiling of the Queens chamber suggest a previous entry. 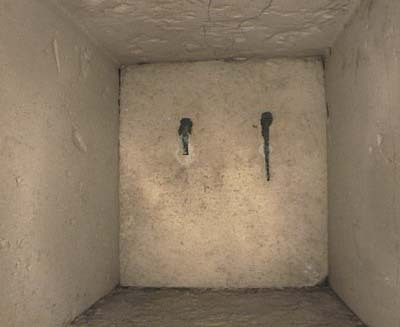 When the top opening of the well-shaft was next noted by Greaves in 1637, notches were found in the passage for footholds. When the bottom was first reached in 1735, it was found filled with rubble from what was probably an excavation from the 'Grotto'. The descending passage, apparently accessible to Al-Mamun, and others, was half filed (150 ft) with rubble when Davison found it, and inaccessible (completely missed!) when Napoleon found it. Several fragments of green and white Diorite were found in the pyramid (and in the landfill outside). These various historical accounts of the pyramid offer some ideas of how and why it was built, and the next section examines the masonry features closer to see if they conform to these ideas. There are several features of the Great pyramid which are hard to explain in terms of a simple 'tomb-theory'. 2). D. Davidson & H. Aldersmith. The Great Pyramid: It's Devine Message. 1924. Williams and Norgate. 7). Worth Smith. Miracle of the Ages: The Great Pyramid. 1934. The Elizabeth Towne Co., Inc, USA. 8). Giza Sphinx & Temples (Pp. 3) - The Great Sphinx - Spirit & Stone. 10). Ian Lawton & Chris OgilvI-Herald. Giza The Truth. 1999. Virgin Publishing. 24). C. Staniland Wake. The Origin and Significance of the Great Pyramid. 1882. Reeves and Turner.